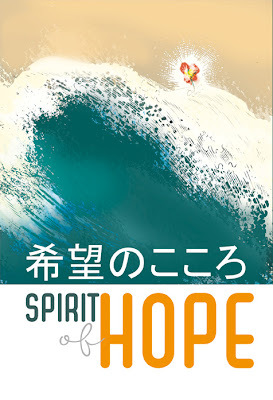 Shortly after the devastating earthquakes and subsequent tsunami that left so many dead, missing and homeless in Japan in March this year and New Zealand, I was asked to contribute to a charity anthology called Spirit of Hope by the UK’s new non-profit organisation The Comic Book Alliance. At that time, I was still trying to put the last few finishing touches to Alan Moore: Storyteller for Ilex Press and attending to several other urgent freelance jobs, and the extremely short two-week deadline made it unlikely that I’d find the time to be able to contribute. I racked my brains for some sort of positive, uplifting angle (as had been stipulated by the organisers, the ) and had pretty much given up on coming up with something worthwhile when I was inspired by a two-minute film in Channel 4’s nightly series 4Thought while stir-frying some chicken and vegetables for that night’s dinner. By the time I was washing up, I had a pretty good idea whatI wanted to do, and granted a few extra day’s deadline extension, I somehow managed to produce two pages in three days, researched, written, illustrated, lettered and coloured (yep, coloured); probably the fastest I’ve ever produced anything in my life. But I really felt like I need to contribute to this cause. Half a page of “This Fragile Earth” is reproduced above; you’ll have to buy the book to see the rest. 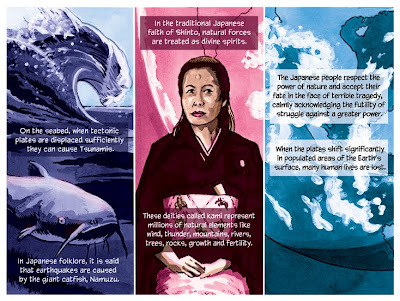 The quality and variety of contributions in the preview of the book that I saw at the Bristol International Comic & Small Press Expo were simply stunning, each piece focussing compassionately and insightfully on the subject matter. Richmond Clements, Jason Cobley, Simon Coleby, Mike Collins, Martin Conaghan, Gary Crutchley, Glenn Dakin, Al Davison, Brandon DeStefano, Benjamin Dickson, Martin Eden, Mats Engesten, Gary Erskine, Al Ewing, Glenn B Flemming, Emma Flint, Henry Flint, Leigh Gallagher, Matt Gibbs, Gary Gilbert, Alan Grant, Jon Haward, Peter Hogan, Kev Hopgood, Graeme Howard, Inko, Rich Johnston, Ant Jones, GM Jordan, Jessica Kemp, David Leach, Tony Lee, Nigel Lowrey, Ciaran Lucas, Paul McLaren, Michiru Morikawa, Alex Moore, Leonie O’Moore, Michiru Morkawa, Eva Perkins, Grant Perkins, Martyn Pick, Maria Pickering, David Pugh, James Reekie, Regan, Neil Roberts, Darick Roberston, John Robbins, John Ross, Declan Shalvey, Liam Sharp, Akiko Shimojima, Si Spencer, Vicky Stonebridge, Lew Stringer, Steve Tanner, Archie Templar, S Thompson, Geoffrey D. Wessel, Chris Western, Andrew Wildman, WJC, Ant Williams, Rob Williams, Sean Michael Wilson and Yel Zamor. It’s a high quality, 116-page full-colour, squarebound book, due for publication on 18th June 2011, and priced at £14.99 + £3.00 postage to UK addresses. All proceeds will be going to help disaster victims via donations to Second Harvest and the New Zealand Red Cross. Readers based in the UK can now place preorders and choose between two covers at the Comic Book Alliance website page here, and advance orders will include 3 small limited edition prints. It’s something I’m proud to be a part of, so go, grab yourself a fabulous book and contribute to a good cause at the same time.